Upholstered furnishings in your home or office must endure several months or years of heavy use, and with time, soil and dirt will begin to show on upholstery and fabrics quite easily. Much like carpeting, soil and dust can become trapped within the fibers of fabrics, causing upholstery and fabrics to shorten their lifespan, harbor dust and allergens, and have faded colors. ServiceMaster Cleaning & Restoration Services are the local leaders for all of your upholstery cleaning needs in Middlesex, Mercer & Hunterdon Counties.Whether if it’s for your home or office, our professional upholstery cleaning technicians will choose the most effective and safe cleaning method to remove soil, dirt, and stains. With our upholstery cleaning services, we’ll help restore colors, reduce allergens and dust, and prolong the life of your upholstered materials. 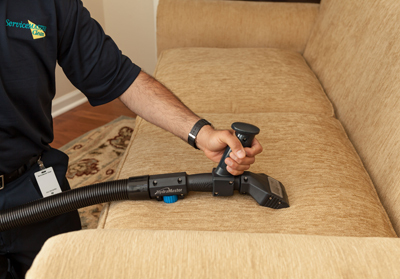 When you partner with ServiceMaster Cleaning & Restoration Services for upholstery cleaning in Middlesex, Mercer & Hunterdon Counties, we’ll handle your furnishings with the utmost care.With our specially designed techniques, equipment, and cleaning agents, we’ll be able to give your upholstery and fabric items a deep clean that they’ve never experienced before. Call us today to schedule or learn more about our services for upholstery cleaning in Middlesex, Mercer & Hunterdon Counties.